Most probably, you are like the rest of us: you’re looking to find your protective, yet comfortable pair of work boots. Safety always comes first but we don’t want to completely neglect comfort, right? Let’s take a closer look at what are the advantages and disadvantages of each one of them so, hopefully, you’ll have a clear idea of what to look out for when buying your best work boots. These are, by far, the most popular ones. The steel toe work boots are ideal for heavy-duty work environments as they offer the best protection against compression or falling objects.Hence the reason you always see them around construction sites. Their massive downfall, however, is their weight. Steel is the heaviest when you compare it to composite or alloy, therefore it shouldn’t be your first choice in terms of comfort. To be fair, unless you work on construction sites, use hard equipment or operate heavy machinery, you don’t necessarily need a pair of steel toe work boots. They tend to become quite uncomfortable if you’re standing on your feet for many consecutive hours. Besides that, they are not great in hot or cold weather and they are not intended to be used in places with electrical hazards unless they are properly insulated and their rating offers you the green light. However, in terms of the protection offered, the steel is, by far, the best in its class. The most popular composite materials you’ll find are kevlar, fiberglass and kevlar. These are all a lot lighter compared to their steel counterpart and they offer a decent protection as well. At the end of a long working day – trust me, you’ll love the extra mobility and ease of movement a lightweight safety trainer offers you. Therefore, the composite toe work boots are ideal for those light-duty working environments like warehouse operatives (yet again, depends on your tasks), on the shop floors or any other job that doesn’t involve dealing with heavy stuff on a regular basis. Another great advantage of these – their heat tolerance. You can make use of them in any hot weather – the same principle applies for those cold, winter days. Plus, great against electrical hazards so I would highly recommend composite toe boots to electricians, for example. When we talk about alloy toe protection, there are two options that come into our minds straightaway: aluminum and titanium. Aluminum is usually cheaper to manufacture than titanium, but it is a bit heavier and less protective. Therefore, if you’re looking to buy a pair of work boots with alloy toe protection I would definitely recommend choosing titanium. It is thinner compared to steel, so you’ll have more room for your toes to wiggle around. But, at the end of the day, in terms of weight: composite is the clear winner amongst these three. In terms of protection, however, the alloy is pretty much similar to steel. You can still confidently use them on construction sites but it won’t necessarily protect your toes against really sharp objects like steel does. In terms of comfort, we’ve got a winner. In terms of protection – well, wait a minute. 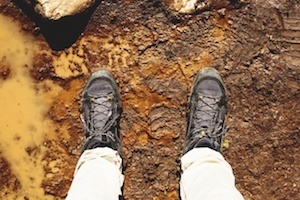 The soft toe boots are usually made of reinforced leather or hard plastic, hence the reason I would never recommend using them in heavy or medium-duty environments. They are ideal for doing small jobs around the house but that’s pretty much it – don’t start using them on construction sites, your toes heavily rely on you! What I love about them is the ability to provide protection against electrical hazards, just like the composite ones. If your job involves a lot of traveling, you won’t be annoyed by those awful airport alarms while wearing these. Basically, they are a great option for someone looking for less protection and more comfort – but that’s about it. These are the 4 types of work boots protection you need to be aware of before deciding which pair fits you best. Before thinking about their design, features or anything else, take a look at the protection they offer. As I previously said, your toes rely on you so treat them right! Thanks for reading, if you have any comments – please let us know in the comments box below! Until next time, stay safe while feeling comfortable!